Part 1 – How One Student Raised More Than $2M in 5 Months and Quit His Job! Part 2 – [You Are Here] – Here’s How One Student Raised More Than $2M in 5 Months! Sep was always a hard-working engineer who loved dabbling in Real Estate on the side. To learn his full story, read the first article in this three-part series! In short, Sep was fresh out of college and thought he’d be happy on his chosen career path. What he learned when his fantasy smashed into his new post-school reality is that he didn’t like his job or the hours he was forced to keep to earn an average income. He wanted to do more of it and took training here and there. However, it didn’t help him much until he stumbled across my story and it caught his interest. He figured out that if I could be a successful investor so could he. That epiphany was a game changer! I’m honored that he discovered my training and proud of what he’s accomplished, especially in such short time. Why did he think he could do so well once he heard about my story? Let me share it with you right now, and you’ll see why. I’ll keep it short. A few years ago I was working as a financial planner, but I didn’t agree with what I was told that I had to do in directing people in ways to put away for retirement. I wasn’t allowed to give clients the guidance I knew would really help them build their savings in big ways. I needed to change my path. You know that saying… Be careful what you wish for? I got change and plenty of it in quick time. My wife became very ill. She was pregnant and developed a condition that didn’t allow her to keep food or even water down. It was horrible to watch her go through that, so I quit my job to be by her side. I had to think of ways to replace my income. It was tough to make ends meet and it was stressful. To blow off steam one day I went out to play volleyball. That went well… until I spiked a ball and landed on another player. That wasn’t so bad… until I tried to stand up and couldn’t. I punctured a lung. It took weeks before I could walk and talk at the same time, or even walk a few feet without severe pain. What next? Nothing much. Just that due to our financial situation we ended up losing our home and squatting in bank-owned property. This might sound like a horrible story, but in truth it pushed me to make the same decision my friend Sep did. I became a Real Estate Investor. I took training and did something different. I did whatever I learned right away so I could see if it worked. If it didn’t, I could ask questions of the instructors immediately and get feedback on what I was doing wrong. That’s how Sep was able to raise more than $2M in private capital in just five months, too! In my last blog post I told you that I would share with you how he did it. I said I’d give you more answers. If you were paying attention to my story, at the end I gave you a huge clue. Sep checked out a Raising Private Capital Mastermind Group I was leading. This is what we used as the basis for the Cashflow Creators video course! It’s part of the Core Membership. Long story short, Sep had tried other training programs, but nothing like this group training experience that pushed him to get out there and try what he was being taught. He had to report the outcome and come back to the next group session with questions. Guess what? It worked really well. Like I shared with you in the previous blog post, at the end of 2014, Sep got to say good-bye to his 9-to-5 job. He’s now a full-time Real Estate Investor and loves it. Plus, he raised more than $2M in private capital for his Real Estate transactions in just five months. Frankly, I think it was less time than that, but who’s counting? At this point, you probably want to know exactly how you can raise private capital just like Sep did. That’s fair. In the last post I promised to tell you more. Get to know the rules of engagement – There are specific rules that govern raising private capital. However, due to changes in these rules, it’s a lot easier now than ever before. Once you know the basic rules, you can even use crowdfunding and post ads to help you get to your goals. You can get in trouble if you don’t do things the correct way, so you need to take time to do your research! Play Cashflow 101 – I said it in my last blog post and I’m saying it again… What happens in the game can happen in real life! Whether you’re interested in raising capital for a Real Estate deal or new business, creative project or other investment, how are you going to get the funding if you don’t talk to like-minded individuals? This game puts you in the room and across the table from people just like you who want to do deals and learn how to work together to get to bigger and bigger financial goals through investing. Perhaps my biggest “secret” in raising private capital, this game is something you need to play weekly. Start by attending other people’s games; then host your own. Browse meetup.com to find games near you. Start a group, too. Listen more than you speak – As an investor, even when you’re raising private capital, you are solving problems. That means you get to do a whole lot of listening. It’s called practicing the 70/30 rule. When you ask questions, follow by shutting your mouth and opening your ears. Listen for key phrases that disclose the other person’s problems that you can solve through your investment transactions. Don’t be so busy rehearsing what you want to say next or shoving your deal down their throat that you can’t hear their words. Listening takes practice. Listening gets deals done. Use the P.A.Q. – You want a great tool that helps you explain in short time the profits an investor will receive by participating in your deal? 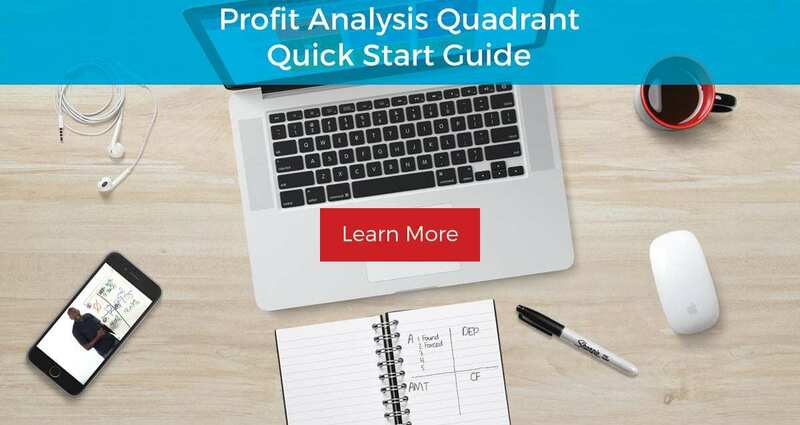 The Profit Analysis Quadrant™ is what I’ve used for years to explain how a deal can be done and what part of the profits go where… and how that can be divided. This tool works so well that I’ve been asked by top investors around the world to show them how to use it. (It’s taught as part of the Cash Flow Core Membership.) The fun part is that all you need is your brain, a napkin and a pen. There’s more to raising private capital than just these five steps, but I don’t want to overwhelm you. Beyond the conversations and networking, beyond sitting with investors (who are people just like you and me), and beyond getting familiar with rules and tools, there are a few more things you’re going to want to do once you get better at doing the first steps. Where are these investors who will let you use their cash and credit in your deals? Why would they be so willing to do it, and what do they get in return? That’s what I’ll go over in my next blog post. It will be the third of three in this series. If you haven’t read the first post yet, go back and do it before moving on. That way, you have a full story.